Video clip synopsis – Cook takes on board an additional passenger, Polynesian priest and fellow navigator Tupaia. Tupaia shares his remarkable navigational skills, convinced that the notion of a great land mass is a European fantasy. Broadband MP4 cooktupa_bb.mp4 (11.4MB), suitable for iPods and computer downloads. The Polynesian Tupaia Joins the Endeavour Voyage is an excerpt from Taking Command, the second episode of the 4 x one-hour series Captain Cook – Obsession and Discovery, produced in 2007. In this excerpt we continue with James Cook’s first voyage to find the Great Southern Continent following his unsuccessful attempt in Tahiti in April 1769 to accurately measure the transit of Venus across the Sun. 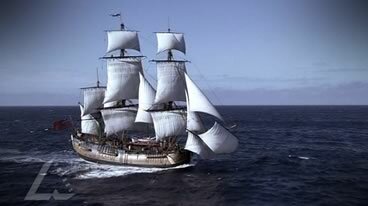 This dramatised version of Cook setting sail on his secret admiralty mission in October 1769 to discover and explore the Great Southern Continent, reveals important insights into the difference between Cook’s attitude and the traditional attitudes of the British to other races and cultures of that time. On board the Endeavour is Tupaia, a Polynesian priest that Joseph Banks has insisted accompany them on the voyage. Banks, who along with the rest of the crew had enjoyed the generous hospitality of the Tahitians, saw Tupaia as a curiosity, “a pet” to be displayed once he returned to Britain who would enhance Bank’s aristocratic status as an adventurer. Cook, however valued Tupaia for his specialist knowledge of the Pacific and his maps covering 2200 km of this ocean along with his ability to interpret and translate the languages of the region. What is the purpose of Cook’s voyage? What is reiterated about Cook’s character in this clip? Who’s Who on the Endeavour? Date of birth and death. Why he was on the Endeavour. What his major achievements were on the Endeavour voyage. What he thought of his ‘discovery’ of Tupaia. How was Tupaia used on the Endeavour? Note down: Banks’ attitude and Cook’s attitude towards him. Using the clip ‘Cook Claims New South Wales’, what does this clip confirm about British views and attitudes towards indigenous people? What does this clip tell you about the difficulties Cook may have faced in his ‘voyage of discovery’? As a group, discuss what you imagine Cook’s aims and attitudes towards his relationship with Tupaia were and what Tupaia’s aims and attitudes were towards Cook? Create a two column table: one column labelled Cook, the other Tupaia. Brainstorm the ideas, aims and attitudes that each had in their relationship. A further discussion point then might be: Is Cook’s attitude typical of his culture? Why? Why not? Is the relationship an equal one? Why? Why not?